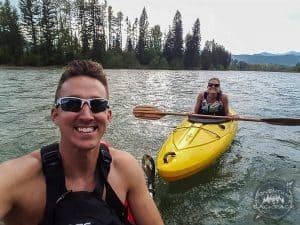 We purchased our kayaks about a week before arriving in Montana, and we were chomping at the bit to get on the Montana rivers for some paddling. The week we got our kayaks, we were able to take them out a few times at Henry’s Lake near West Yellowstone, but we were ready to explore the rivers in Montana for some kayaking! Columbia Falls is the cute little town right outside of the west entrance to Glacier National Park, and that’s where we stayed for our time in the Glacier National Park area. 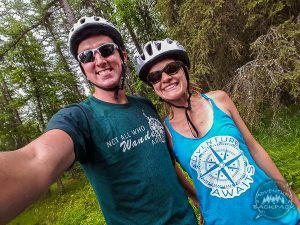 We first stayed a few days with a great host from Boondockers Welcome, and then we made our way out to National Forest land to camp for another week while enjoying the area. At the first sight of clear weather, we headed out for some kayaking in Glacier National Park! Paddling a river requires an entry launch as well as a take-out point, and those both require transportation. There are places that offer shuttle services for kayaking Glacier National Park and the surrounding areas, but we decided against that. After all, we had three modes of transportation with us: car, kayak, and bike! We dropped our bikes off at the take-out, which was just about two miles via land away from the entry launch. After chaining up our bikes, we came back to the entry, parked the car, and got our kayaks in the water. 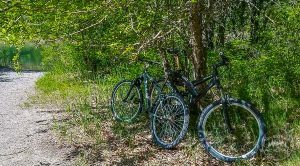 After paddling down McDonald Creek, we rode our bikes back to the car at our entry launch. It was a very scenic ride! We began kayaking Glacier National Park at the boat launch in the Apgar Village. Immediately, we were in awe with how clear and blue the water was! From the very beginning of the paddle, we could see every pebble at the bottom of the lake. Even as we paddled further and the lake got deeper, it was still easy to see 15-plus feet below the surface. 15 Plus feet of visibility in the glacial waters of Lake McDonald and the water was SO BLUE! Did I mention how BLUE the water was? Wow. We paddled around the lake for a while before trekking over to the mouth of the river. The mountainous backdrop behind the perfect blue lake reminded us of something out of a storybook. With perfectly blue skies and the sun shining, we didn’t want the day to end. When we finally decided to kayak over to the mouth of the river, again we were taken aback at how blue and clear the river was as well. I had to wonder if all of the rivers in Montana were so clear and blue (they aren’t)! And there were so many fish in the river, too. I felt like I could just reach down from my kayak and grab one (get that on video)! I didn’t try, though, as they were so peaceful just swimming around enjoying the day like we were. The Lower McDonald Creek was running quickly enough that we didn’t need to paddle much other than the occasional directional paddle. This is a nice, calm, easy paddle and has no rapids or other obstacles. 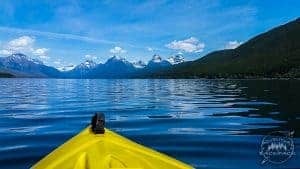 It would make for a great kayaking trip for families just wanting to relax on the water, or anyone just wanting a relaxing and scenic view of Glacier National Park. The calm waters of McDonald Creek make for a great family paddle. Just relax and let the current take you away! As we continued down the river, we saw just a little bit of wildlife. It is recommended to bring bear spray with you (which we did) on this paddle, as bears are very active in the area. We did not see any bear, though. Just a lot of birds, geese, ducks, and fish! But it was fun watching them as well! Winding down the scenic river, we made our way to the end where our bikes were awaiting us. It was a relatively short paddle, taking us about 45 minutes from start to finish without much paddling. Admittedly, we both were not ready for it to be over! The next take-out at Blankenship Bridge is approximately 10 miles by bike away from our initial take-out. We contemplated doing another stretch but decided against it this time. But we enjoyed that paddle so much, we decided to do it again, and add the extra 10 miles on! 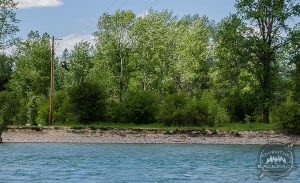 Our campsite was not too far from another beautiful Montana river, the North Fork of the Flathead River. After scoping it out, we decided to give it a paddle as well. 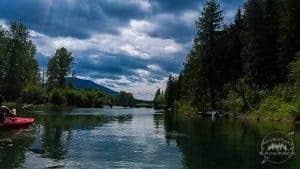 The North Fork of the Flathead River is the ending boundary of Glacier National Park, and the boundary is actually in the middle of the river. So, on one side of the river you are in the National Park and on the other side you are in the National Forest! 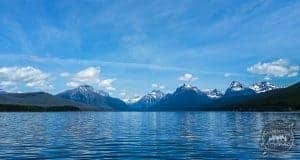 This is another good option for kayaking Glacier National Park’s surrounding areas. The take-out for this paddle is the secondary take-out for the McDonald Creek kayaking as well, at Blankenship Bridge. This is the confluence where the two rivers merge into one. 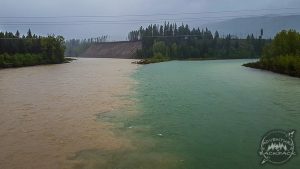 It’s pretty wild to see the blue waters of the McDonald Creek come together with the emerald waters of the Flathead River. They don’t exactly mix right there; they just flow almost alongside each other. 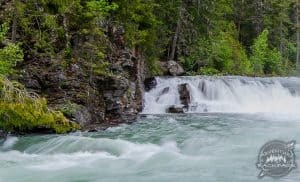 The confluence of where the North Fork of the Flathead River merges with McDonald Creek is a wild sight! 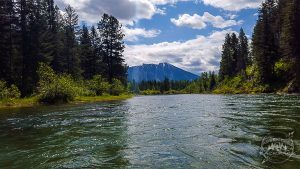 This was our take-out point for the North Fork of the Flathead River as well as the longer version of the McDonald Creek paddle. For this trip, we decided to bike first then kayak down to our car. The bike ride from Blankenship Bridge to the launch point is 4.2 miles, and it took us about a half hour to ride back. 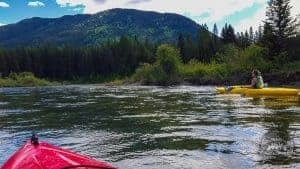 Once we got back, we got our kayaks in the water and got to kayaking the North Fork of the Flathead River! The river was pretty calm on the day we paddled. It was bright and sunny out, and the rain hadn’t been too heavy (yet). This is a very easy paddle and there are no rapids. Every once in a while the water got a little rough, which could catch you off guard and potentially flip you, but generally it was an easy and calm paddle. 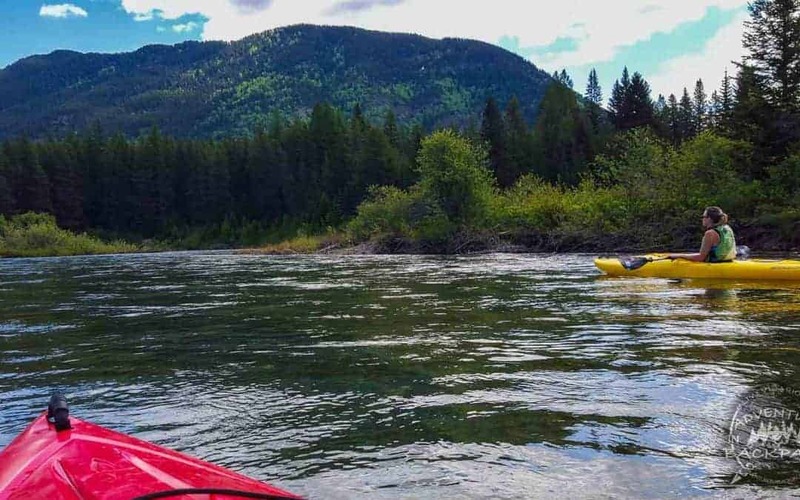 This section of the North Fork of the Flathead River is pretty calm and an easy paddle. Similar to the short section of McDonald Creek, you can relax and enjoy the scenery. Winding your way down the river, you’ll have plenty of opportunities to see some wildlife. Unfortunately, we did not see anything other than birds, ducks, and geese, but it was still good to see those! This is another kayaking trip that you will want to bring your bear spray, as bears are very active in the area. 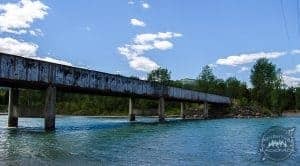 The trip comes to an end when you reach the Blankenship Bridge and see the confluence of the two beautiful Montana rivers. I highly recommend having your takeout on the east bank. We took out on the west bank, which is very steep and full of loose rock. It was very difficult to get the kayaks (and ourselves) up the bank without just sliding back down. Ugh. We got a round of applause from a lovely couple who were enjoying the view of the river when we emerged unscathed!! This is a stupid problem to have; but it is a problem nonetheless! We struggled to get up this steep bank with loose gravel! After we got our sea legs (river arms??) under us, we decided to take the longer trip down McDonald Creek all the way to Blankenship Bridge. This is about a 10-mile section of the river, so we knew it would take us a while. But we were both so excited to go for a longer paddle, and since we had been cooped up in the RV for a while due to rain, we were ready to go! We were ready to take on the full 10-mile section of the river this time! When we set off, it was bright and sunny and a gorgeous day. There was only 10% chance of rain in the forecast, so we were good to go (no foreshadowing here). We again paddled around Lake McDonald a bit before heading off into the creek. We quickly got to our previous take-out point and realized just how short of a paddle that was. We were happy to keep going! After that point, we did need to keep a closer eye on the river, as we weren’t able to scout the entire thing due to accessibility. So we needed to be sure we weren’t about to paddle over a waterfall! Keeping an eye on what is ahead of you is super important when you are paddling an unfamiliar river! Watch out for waterfalls! It had been raining quite a bit the prior week before we took this paddle, so this kayaking trip was a bit faster current than our previous two kayaking trips. The water was still manageable and there were plenty of calm sections. But there were also some very fun sections! Our first adrenaline pump was just a little bumpy area that had some fast moving water and tiny rapids. Nothing to write home about for experienced paddlers, but for the two of us beginner paddlers it was an experience! Nate nearly tipped, but he saved himself like a seasoned kayaker. No big deal! Then it started raining just a bit. And by just a bit, I mean it was pouring. Oh well, we were in the water already, so no big thing to get wet! Our only complaint was the lack of visibility. Sunglasses on and we needed windshield wipers; sunglasses off and we needed eye protection! It was a lose-lose, but we paddled on. Luckily, it didn’t rain the whole time. It stopped just long enough for us to hit our first “uh oh” moment. We came up to these rapids and the worst part was that we couldn’t see what was on the other side! Were there more rapids? Was there a waterfall? Was there a big rock? No idea. Steph was in front and she paddled quickly into a little eddy to try to assess the situation. Well, we figured that our only option was to go for it, as we still couldn’t see anything past the turn. So Steph went first and hollered back to Nate that all was AWESOME!!! It was just a little rapid, but it was so much fun paddling through it and getting SOAKED in the process! Steph emerged unscathed with the biggest grin she could muster and turned to watch Nate paddle through like a champ! Haha! We are officially in LOVE with kayaking. Paddling down some unknown obstacles and all Steph can do is smile like an idiot! What a goober! Those rapids were AWESOME! It wasn’t long before the rain came back and soaked us to the bone again. Oh well, we were still having a blast! We paddled along and before too long, we were at the end of our kayaking trip, back to Blankenship Bridge. That was an epic trip and we were so happy we did the longer section! Some parts might not be suitable for just an easy-going rafting with the family trip. The end of the trip. Bummer it was over, but we had a blast! We grabbed our bags, chained up the kayaks, and set out on our 10-mile bike ride back to the car! It is a scenic ride, but it is on the road (back road and just a tiny bit of highway) for most of the ride. It’s up and down and is a nice ride, not too strenuous. It was a great way to end the trip, although it rained almost the whole ride so we were SOAKED by the end of it! What a day! Ending our paddle with a 10-mile bike ride in the rain and we were soaked to the bone, but still all smiles! We had a blast! Overall, there are plenty of great options for kayaking Glacier National Park. You aren’t going to go wrong with the beautiful Montana rivers that run throughout the park and surrounding areas. 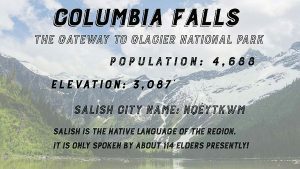 Glacier rivers are a gorgeous sight, so we highly recommend getting out and exploring as many of them as you can. 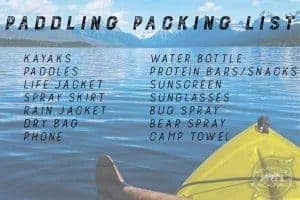 There are tons of options for Kayaking Glacier National Park, so you can’t go wrong! 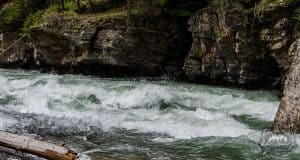 Options for kayaking Glacier National Park can be scouted at the Apgar Visitor Center, where they will give you some insight to the surrounding areas. It’s always a good idea to stop in and ask, as they will be able to let you know if any of the rivers or roads are closed in the area. Kayaking Glacier National Park’s surrounding areas is an awesome experience as well, so if you don’t want to pay the fee to get into the park (it’s $30), visit some of the other options around the area. You are sure to have a good time paddling no matter where you choose! Have you kayaked in Glacier National Park or the surrounding area? Tell us about it in the comments below! We would love to hear your experience! Be sure to subscribe to our blog below and check us out on Facebook! Until next time, Live Vicariously!